And we thank you dearly for supporting our efforts! 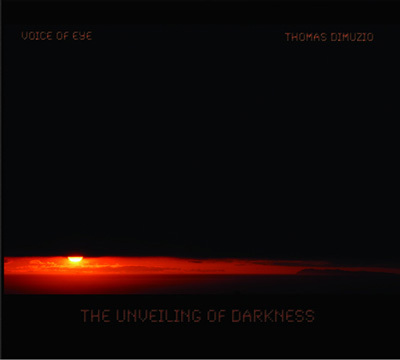 Like minds united for "The Unveiling of Darkness" CD (also to be issued as a limited-edition double LP) as Thomas Dimuzio and Voice of Eye worked together from near and afar to record as one. A brief correspondence in the early 1990's brought the artists into contact and found them eager to collaborate, yet it wasn't until 2008 when they would finally meet at the San Francisco IAMINDUST festival. The next year found them each performing again, but this time a studio recording session ensued. Jim Wilson's incredible home-spun instruments and the angelic yet demonic pitch-perfect voice of Bonnie McNairn are processed and fractured through the sonic lens of Thomas Dimuzio. Highly focused, the recording session embarked while relishing in the twilight of an ocean sunset from their San Francisco vista. The light and environment couldn't help but to influence the studio improvisations which were refined, overdubbed and eventually transformed into the sky scored patterns and heavenly bodies of the darkness unknown. The album's expressive cover photos capture similar textures and striking moments in time. 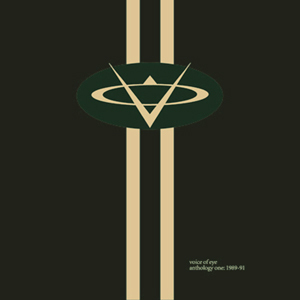 This is a collection of early rare & unreleased tracks from the U.S. dark ethno/drone cult-project recorded 1992-1996, all re-mastered by VOICE OF EYE themselves. You can find here the famous "Sprocket" 7" for Drone Records (1994), the lost mCD for ND that was never released (1995), rare compilation tracks (some of them never came out), plus a complete rehearsal for a live show (1996) and an extract from Tryst 8 (split Cassette with BIG CITY ORCHESTRA, 1995). ANTHOLOGY 2 is the second volume of rare material, the first one was released last year on the prolific VINYL-ON-DEMAND label as do-LP. This is also the first non-Troum CD-release on Transgredient Records as they couldn't resist to release this fantastic material !! Six-panel Digipack design with historic photos by Conundrum. This edition 1000, released Feb. 2011, Transgredient Records, TR08, Germany. Anthology One is culled from the first three cassette releases by Voice of Eye; Isolation, Voice of Eye and Resonant Fields / Hot Gypsy Fink Hell, all three Tapes released on their own Cyclotron Industries Label between 1989-1991. These are the earliest recordings by Voice of Eye. 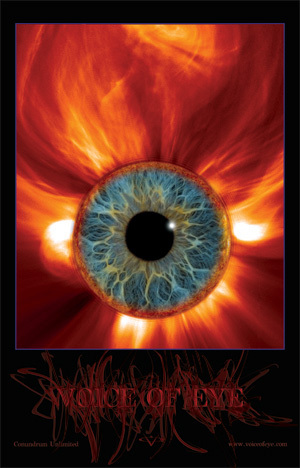 Voice of Eye can be doubtlessly described as the protagonists and godfathers of the special genre of Ambient-Ritual-Music. Their specialty is "organic sound sculpting": a form of electronic ethnic ambient music that relies mainly on electronic drones and manipulated instruments including instrumentation with special self-built instruments. The music is all improvised over a period of two years and covers the evolution of their early sound. It will immediately catch your attention and pulls you into an altered but extremely positive state of mind. This is the first in a series of Anthology releases documenting hard to find Voice of Eye material and previously unreleased recordings to be released on several labels in the near future. Gatefold designed by Jim Wilson. This edition 600, released 2010. In August of 2009, Soriah invited Voice of Eye to play for his Atlan CD release party in Portland, Oregon, USA. In the anxious hours before a show what does Voice of Eye do to unwind and pass the time? Well, play a little music of course! Scouring Soriah’s house for instruments, they commandeered some unfamiliar and handmade devices to play with. 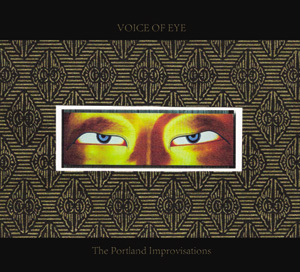 The result is The Portland Improvisations, where Voice of Eye are at their most raw and unadorned. Here are three minimalist improvisations that float in dark time haunting the listener with lost landscapes from distant worlds. Minimal and oppressively ominous they are perfect for a rainy afternoon on Altair IV. Also included as a bonus track is “The End of All Things”, the latest studio recording by Voice of Eye about the loss of a hard drive. The track lures the listener in and then liquidizes and deconstructs all hope leaving a powerful and ravishing emptiness stripped of embellishment. Full color digipack and disc design by Jim Wilson. Factory pressed CD-R. Limited Edition of 500. August 2010. 11”x17” full color striking mandala poster that will open your 3rd eye. Long out of print, now available by download. The impossible to find CD from 1995, Transmigration has now been remastered and re-released for digital download. 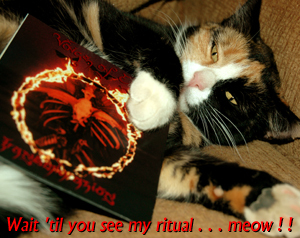 Transmigration is known as the darkest, scariest VOE release ever. What do you expect: it's all about death and beyond, as the name implies. But if you do not fear the greatest mystery of life, then you may not get the shivers in yer timbers. It is now available from the iTunes store and Napster. If you've been waiting to get yer paws on this, now is the time for rejoicing! Create a new ritual to burn everything away! Click here to go to Napster or visit the iTunes Store. 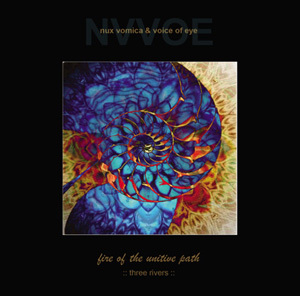 Alchemical structures of beauty and noise described in this 2009 collaborative improvisation of Nux Vomica and Voice of Eye, recorded at Auricular Studios, CA, and co-released by Auricular and Conundrum Unlimited. Full color artwork by Alan Herrick. March 2010. New from Voice of Eye arrives a soundscape of creaturely communications emanating from an organic primordial world. Preceding the human tribal social orders were the ways of the forgotten and unnameable beings. The listener will be transported deeply beyond the lizard brain to unknown realms. Recorded in the coastal redwood forests of northern California. 18 minutes. Full color disc artwork by delphine ancelle-b. January 2010. Old Europa Café of Italy has re-released Emergence & Immersion in a fine 2-CD 4 page full-color digifolder, re- mastered with a new bonus track, “Peacock Symphony”, offering 2½ hours of music. Now those impossible-to-find, extremely limited CD-R releases are finally available… on factory-pressed CD’s! Spontaneity and raw emotional expression punctuate and keen throughout. Although completely improvised, the music seems amazingly composed. One can intuit that the musical re-uniting of this duo created a vortex in the worlds. The track titles hint at experiences within the music: “My Little Vamp Creatürlings”, “Sky Breathes Stars ‘til Dawn”, “Island of Dr. Moreau Nightclub”, “Ode to Every Circus Dog”. Wildness, beauty, humor, darkness, fear, horror, yearning, grief and vast spaciousness inhabit this mysterious lively music. Send payment by PayPal to voice_of_eye@yahoo.com or email us for a PayPal invoice. Or send check or money order to : Bonnie McNairn, P.O. Box 1055, Taos, NM 87571. Seven Directions Divergent (2009). Taking over a year to produce, Seven Directions Divergent is the third CD to be released on Conundrum Unlimited. As artists experimenting with sound we have been inspired by many different styles of music and noise. Seven Directions Divergent pays homage to some of the diverse musical sources that have influenced us over the years from traditional Sanskrit chants to Steve Hillage to cute Euro pop to shamanic transcendence. This is an ambitious project melding many different sources together with the ethereal beauty and yearning magnificence you expect from Voice of Eye. This CD transports the listener along a narrative history of our personal journeys of change and transformation as told through the medium of sound. 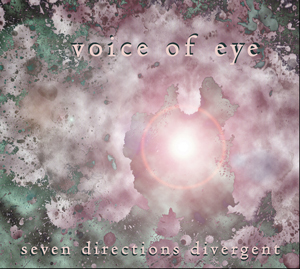 Seven Directions Divergent was mastered by award winning engineer Jon Gold for the best sounding Voice of Eye release to date. Comes in a Digipack with beautiful full color artwork by Jim Wilson. 10" on clear vinyl with golden love from Drone Records...Limited to 500 copies. This 10" has 3 tracks with NEW material (entitled "VIRYA", "DHYANA" and "PURUSHA") inspired by the wisdom of buddhist & advaitic meditation & philosophy, where the contemplation within music & sounds appears as a tool to reach a higher consciousness & awareness of reality. This highly sublime & emotional "other-dimensional" ambience is based on ethereal vocal material, flute-sounds and their typical self-built string-instruments, full of yearning and beauty - almost 39 minutes of material pressed onto clear vinyl with golden striae, with superb artwork by THOMAS DOHMEN. This is the celebration of the "Unknown", seen as a state of mind where the Ego dissolves into a timeless universal consciousness. Please support our artistic endeavors by purchasing Voice of Eye music. We understand the temptations of downloading and copying music for free, but that makes it hard for us to keep putting it out. There are some websites that are illegally charging to download our music. NEVER buy from these websites as we receive no compensation from them. We will be posting friendly websites to download our music and posting much out-of-print material right here. And if you HAVE copied or downloaded our music and want to send us a donation, or just because you want us to keep doing this, we would so appreciate your encouragement! We love making music. Thank you all for your support! 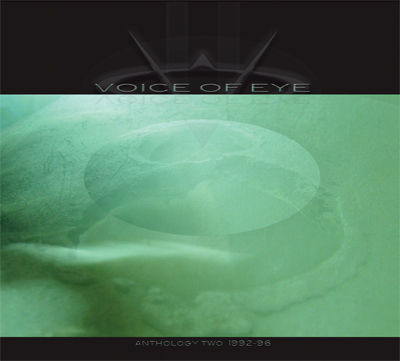 Voice of Eye: Anthology One 1989-91 2-LP Gatefold, Limited Edition 600, Vinyl On Demand VOD 2010: $40. Only a few left! Voice of Eye: Mariner Sonique CYCICD111 1992: SOLD OUT. Try Old Europa Cafe or Soleilmoon. 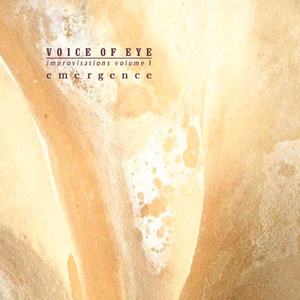 Voice of Eye: Emergence CDR 2007 Ltd.Ed 100, SOLD OUT. First release on Conundrum Unlimited. 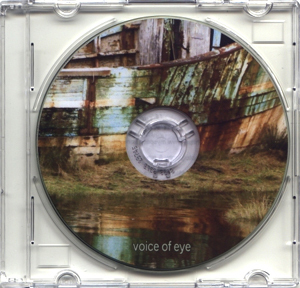 Voice of Eye: Immersion CDR 2007 Ltd.Ed 100, SOLD OUT. First release on Conundrum Unlimited. 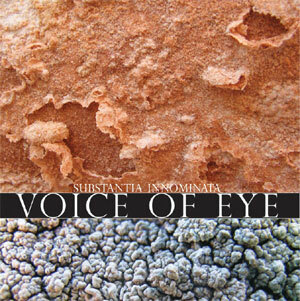 Voice of Eye/AsiaNova split release: mini-CDR 2007 Ltd.Ed 100 on Old Europa Cafe. SOLD OUT. Your list of releases you'd like to buy. We will hold them for you while the payment is in process. Your payment preference; see Payment Options below. Orders will be shipped by US Mail. For US addresses add $4 Shipping for up to 2 CD's then add $1 for each additional CD. For European addresses add $10 Shipping for up to 2 CD's then add $1 for each additional CD. Elsewhere, email first for shipping cost. PayPal: We will email you a PayPal invoice, you then pay us through the internet with your account, check, or credit card. Foreign currencies work fine with PayPal too. Then we send the order right away. Money Order: Send us a money order by mail, payable to Bonnie McNairn, once it is in our hands we will send your order within a day. Personal Check: Send by mail, payable to Bonnie McNairn, we will wait 10 days while it clears, then we will send your order.